Our monthly Bright Side community newspapers have a tradition of local news coverage with a positive view. We keep the community informed about upcoming events – concerts, awards, festivals, local businesses. . . the events of families, schools, churches and civic groups, plus a full calendar of events to help plan your coming month. The Bright Side reaches more than 30,000 homes across southern Cobb County each month. The Bright Side Community Newspaper is published once a month and delivered by direct mail to residents in the Zip Codes listed above. The Bright Side is delivered by the U.S. Postal Service (not thrown on the ground). The Bright Side of Smyrna-Vinings-South Cobb mails to 20,000 homes in Smyrna, Vinings – 30080, 30082, 30339; 30106, 30126, 30111 & 30082. Unlike other media – advertising circulars, “magazines” with no local content and giveaways that are distributed through convenience stores — The Bright Side has high readership because it goes directly into the home. Most of our stories are submitted by our readers. The Bright Side is published by Lipsett & Associates, Inc. and owned by Cathy and Allan Lipsett, Publishers. 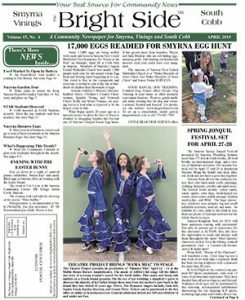 The Bright Side is Cobb County Georgia’s monthly Good News Newspaper covering Smyrna, Vinings, Mableton and Austell, GA.